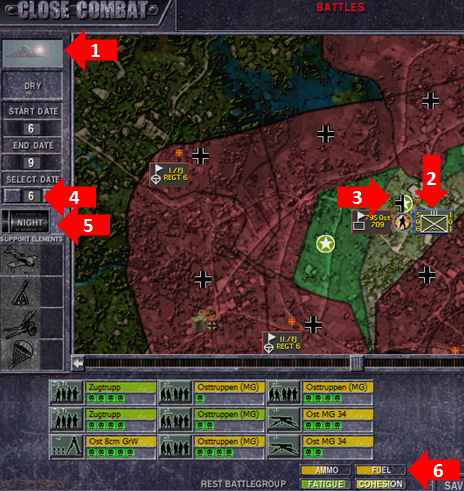 On March 23 Platoon_Michael and I decided to have a classic Battle of the Bulge grand campaign. 15 minute games with morale on, Michael playing as Germans. Neither of us had played CC4 in awhile, let alone made it any significant progress playing out the grand campaign in the last few years. Starting the game, the force strength bar was in his favor but I like an underdog fight and I knew most battles I would be fighting to survive. In fact, the very first battle I was disbanded by a German group with Panthers at Simmerath. During the opening days of the campaign as Allies my hands were tied. 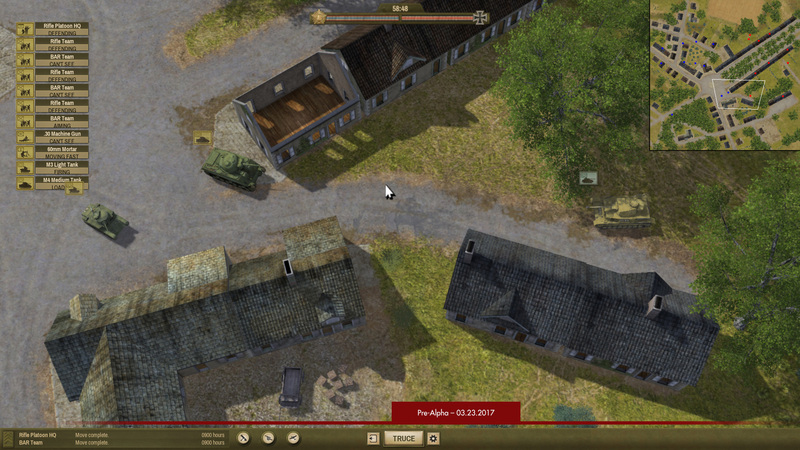 I was fighting with many under strength battle groups without armour and very little anti-tank weapons. I was facing German groups that could field five Panther tanks turn after turn. My Southern flank was crushed. The German spy network was working overtime to completely screw my chances at countering his drive in the South. Turn after turn all my units were redirected which also resulting in other units getting stuck behind the front line. The spy network was so effective that Bastogne fell without a fight, I couldn't get any of my units in there for a defence, a massive victory for Michael. On December 19th, the spy network was no longer operating and I now I can attempt to clean up the mess. One aspect of CC4 that was the bane of its existence was the locked forcepools. So many of us shunned it back in 1999 due to that, it was a huge change from The Russian Front. Now however, locked forcepools are something I can appreciate. Combine this aspect with a 15 minute timer and morale turned on you can easily get up to five games completed in one hour! The extremely small maps also help keep up the fast paced nature of CC4. There are very little options for defence. The maps are only a couple hundred meters wide, you are literally dropped into a cage and must fight for your survival. The fights a very lethal and the stakes are multiplied by having morale on. Relearning the units combat qualities was also costly. The German Infantry Gun carries a ton ammo, is mobile and has a very high rate of fire. I found this out at Wardin on December 18th. Watch this video at the 3:45 mark. I was not prepared to counter that unit and it steamrolled my infantry. During the next battle on December 19th, all my infantry teams focused on it with small arms fire and the gun went down very slowly, only after the outcome of the battle was decided. German flamethrower teams are another unit that is hard to face. These teams also have a high rate of fire but less killing per shot that we are used to in CC5. You cannot engage these units in house to house combat. They are not easily suppressed either. American antitank weapons like the 57mm antitank gun and bazooka are effect vs all armour and vehicles. However, head on vs Panthers both Allied units will lose. Side and rear shots are required for more than damaging hits. If you are cut off from supply, the 57mm guns will expend all ammo very quickly.The size of the maps limit your ability to get beside or behind a Panther. Sherman 76mms and M10s will also have a tough time head on vs the Panther. 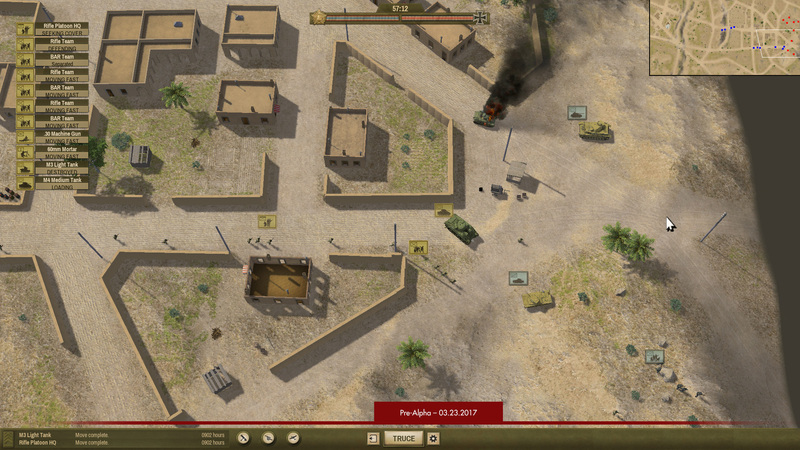 Multiple tanks vs one Panther is effective in the sense that they will knock out the combat effectiveness of the Panther, but not destroy the tank. Over and over again I see Michael pulling a Panther back due to losing its main gun or too many crew members. I am recording each battle of the GC, this will be the first and only complete grand campaign uploaded to Youtube to date. We are 62 battles in with about nine hours of total play time. We are currently on December 20th Evening about to make strategic moves. We have both had our days of defeats and days of victory. One thing the Allies do not have are any heros with huge kill counts. Attrition is extremely high and most of my men do not survive more than two or three battles. Select Page 1 2 3 4 5 6 7 8 9 10 11 12 13 14 15 16 17 of 17 pages.